This entry was posted in Chaosium's Basic Roleplaying System, General and tagged 12 Days of UK OSR, Alephtar Games by Newt. Bookmark the permalink. Wow, thanks for the review Newt. Having one of my books praised as worthy of publication as a series of White Dwarf articles really warms my heart. The early issues of White Dwarf were seminal to my love of RPGs and I still have my sadly incomplete collection in pride of place on the top shelf of my gaming bookshelves. With Call of Cthulhu being about as fiddly as I want my BRP to get, I was wondering how well this book would combine with OQ. Ok, I’ve read through but never played some RuneQuest. 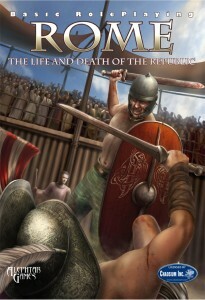 I know that BRP is not RuneQuest is not just Glorantha. But using RuneQuest in Rome, does this supplement have rules for Roman cults, charms, etc.? There are plenty of setting documents (both suited to games and those suited to study of culture and history) but what I’m most interested in is the specific tools for “how does my centurion honor the gods?” and what that means for the game.